While it wasn't exactly a launch game, the original Dead Rising was one of the Xbox 360's early exclusives and one of my early favorites on the system. After a brief, mostly disappointing, adventure into multi-platform for Dead Rising 2, the series returns to its Xbox exclusive roots as a launch title for Xbox One. Main character Nick Ramos follows in the footsteps of Frank West and especially Dead Rising 2's Chuck Greene as an everyman with a knack for improvisation. He and his friends are trapped in Los Perdidos, California with six days to get out before the government firebombs the city out of existence. Nick can put together weapons and, this time, vehicles to wade through the shambling horde or just flatten it under a steamroller. 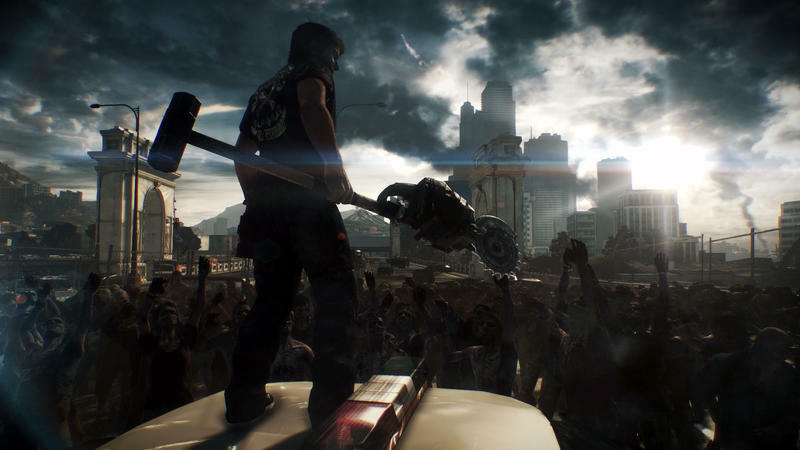 With early concerns the game is moving in too-serious a direction and the additional burden of being a launch title, does Dead Rising 3 stack up to the standard set by the original? Like a particularly ripe zombie, Dead Rising 3 is bursting with potential, but sometimes it works against itself in frustrating ways. Those concerned at E3 about the serious tone have nothing to worry about. If you want to run around in a cocktail dress, beating the undead back to death with a clothes hanger, you should be able to get there in the first hour. A big part of what makes the game fun is part of what would've kept it from working on Xbox 360 or PlayStation 3. The number of zombies on screen at any given time is absolutely staggering. The game does stutter and suffer from occasional pop-in, but they're rare enough that they didn't affect how I felt about the title at any point. With that said, that's really the big next-gen feature of the game; the graphics are fine, but nothing that'll sell consoles. The online component works but doesn't do anything particularly new. 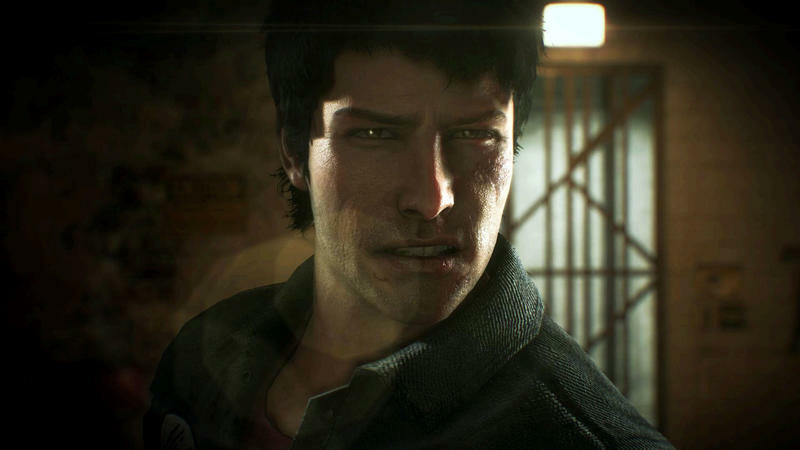 The other aspects that capitalize on the platform are the Dead Rising 3 Companion through SmartGlass and the ability to resume directly from a suspended game. The companion is pretty fun but doesn't add anything crucial to the game. There's nothing about it that requires a touch surface or a secondary screen, but it's worth the time if you have the technology handy. The ability to quickly locate a type of store, view the map, and even summon air strikes is great. Dead Rising 3 lets you save anywhere you like this time around, and as it's on Xbox One, it's supposed to let you resume a suspended game. A few times, this actually worked. But frustratingly, most times I had to load the game from the title screen. This wouldn't be so bad if the initial loading time wasn't so long. Loading times are nonexistent once you get into the game, but the initial loading time is pretty lengthy. 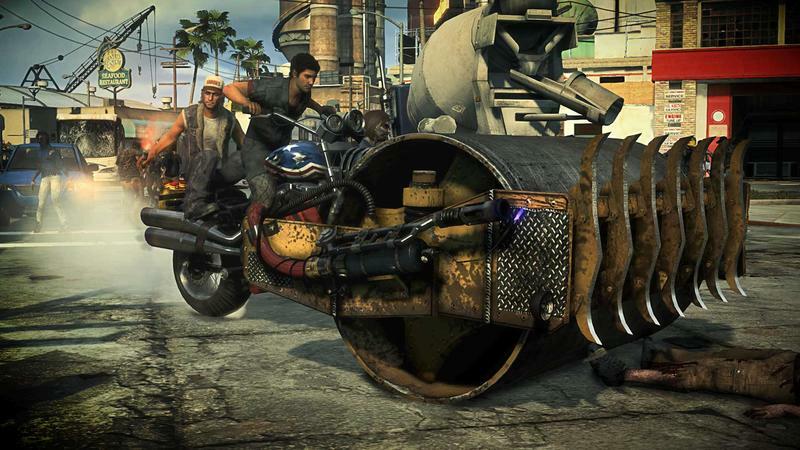 Dead Rising 3 is also significantly more spread out than its predecessors, making good transportation an absolute necessity, and that's where Nick's unique ability comes in. Like Chuck Greene of Dead Rising 2, Nick can combine all sorts of items to make a weapon for every situation (every situation is killing zombies); but, Nick isn't just a warrior, he's also a mechanic. Vehicles abandoned throughout the city are just waiting, hazard lights on, for Nick to hop in the driver's seat. Pull up next to the right companion vehicle, and in seconds, Nick can whip up a much more durable and heavily armed combination of the two. One highlight is the RollerHawg, a steam roller-motorcycle with massive flamethrowers accenting the sides like a pair of devil horns. The variety of vehicles makes getting from one city area to the next fun and fast, but once you're in those areas, that isn't always the case. Even though the game already cripples the experience rewards obtained by killing zombies from your vehicle, it also seems determined to pull you off your mount as often as possible by putting up roadblocks all over the place. The worst part is that just about every vehicle backs up like a semi and stops like a boat. 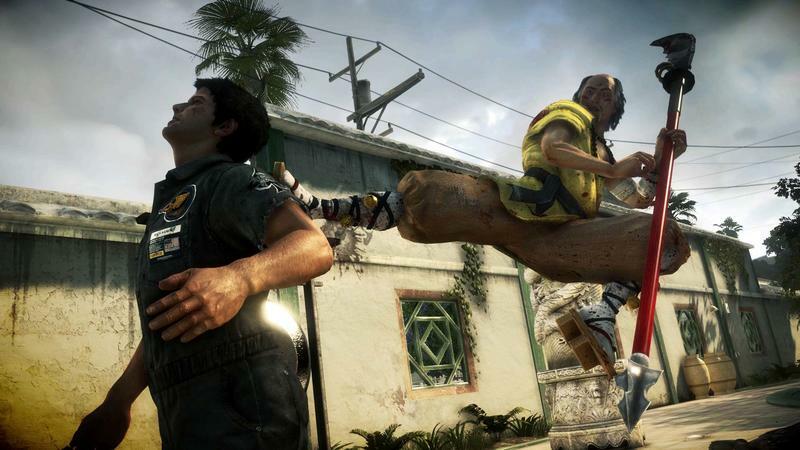 While the tone of the game overall is unabashedly ridiculous, Dead Rising 3 struggles with balance in a number of ways. One of the weapons, for example, called the Electric Crusher, is a bit of a win-button. The weapon's primary ability starts a chain lightning reaction that strings from zombie to zombie as you run through a crowd. As long as the zombies never thin out, one swing of the hammer will keep netting you experience that multiplies as the bodies stack up. I found this weapon pretty early into the game and, when I wanted to, I could level up in minutes. It was still fun to use, though, just to see the waves of zombies falling at my feet as I waded through the crowds. The power of the weapon wouldn't be so bad if you had to find pieces around the environment to build the weapon each time. But that's not the case – there are safe areas throughout the map that include, along with an outfit closet and a survivor-summoning mechanic, a supply closet. I could, at any moment, walk up to the closet and summon any item I'd previously picked up or created. While this helps mitigate the stress inherent to the game's time-based story, it also takes away from the cobbled-together feel of the weapons. You can enter any situation equipped to the nines as long as you stop by a safehouse beforehand. As a result, I found many of the boss battles painfully easy. Even with the supply closet, though, it's still fun to see what items the game designers think should be put together to make a weapon. Because why wouldn't you combine a katana, a scythe, and a grim reaper mask? Locating and then actually getting access to all the blueprints scattered across Los Perdidos ends up being one of the more fun activities in the game. Just like it did on Xbox 360, Dead Rising 3 stands out as one of the first memorable titles on a new Xbox console. While many aspects of the game have a good and bad side to them, the only part of the game I really have nothing nice to say about is the writing. It's the bad kind of stupid. Most of the dialogue is boring or silly, but when it comes to the Psycho bosses, it moves from just bad to offensive. Most of the psychos are meant to fit into one of the seven deadly sins, but instead they end up just being hackneyed stereotypes with the worst of them setting a character up as a transphobic joke while another is shoehorned into the 'emasculated Asian guy' stereotype. Of all the minor issues with the game, this is the only one that left any kind of negative taste in my mouth. It might sound like I didn't enjoy the game, but Dead Rising 3 is some of the most fun I've had with a title yet this fall. Zombie slaughter has escalated wildly thanks to the amount of zombies on-screen at any given time, and the combination weapons only add to the fun. The vehicles change things up nicely, even though they control more like grumpy elephants than they do like cars. Aside from killing zombies, there are tasks to complete that net you experience points, as well as the collectible blueprints and recipes for items and food combinations, the random survivors you can help out along the way, and the survivor missions that end up with one joining you to fight. There's a ton to do and most of it is quite fun. The blueprints, which are for both weapons and vehicles, do a good job of encouraging exploration of the map. 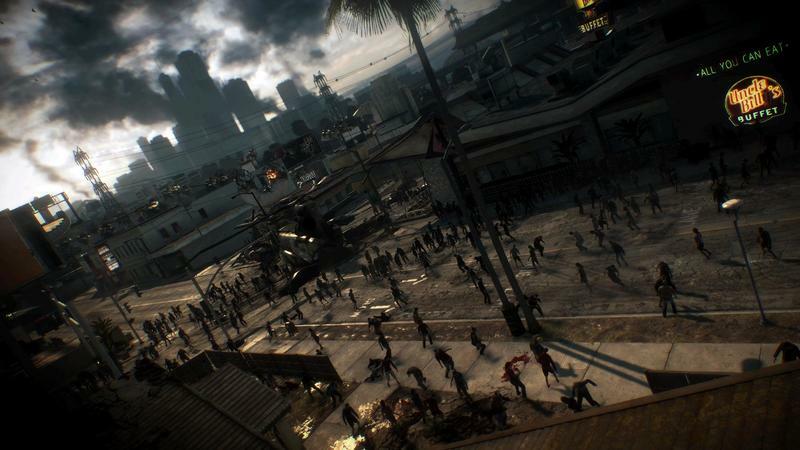 Just like it did on Xbox 360, Dead Rising 3 stands out as one of the first memorable titles on a new Xbox console. It's fun and, more importantly, it actually feels like a complete product when compared to some of the other launch games that feel rushed out the door or seriously compromised for the free-to-play market. I'm looking forward to going back in to keep that zombie kill count climbing with my trusty Electric Crusher for a while yet to come. We purchased Dead Rising 3 with company funds. We completed the single player mode and experimented with multiplayer and second screen options before starting this review.